While I absolutely abhor the word ‘diet’ (shudder), lately I’ve been making a conscious effort to improve the way I eat. I hate rules, and just cannot stick to any hard and fast limits I set myself. To that end, one of my very loose and immeasurable guidelines is simply less carbs. We all know courgetti is a great way to swap out carb-laden pasta for an extra dose of vitamin rich veg, but how about cauliflower as a carb-stitute? This recipe actually comes from Hemsley & Hemsley’s book, The Art of Eating Well (which, for the record, is great), with one or two additions and tweaks from me; because when can I ever leave well alone? 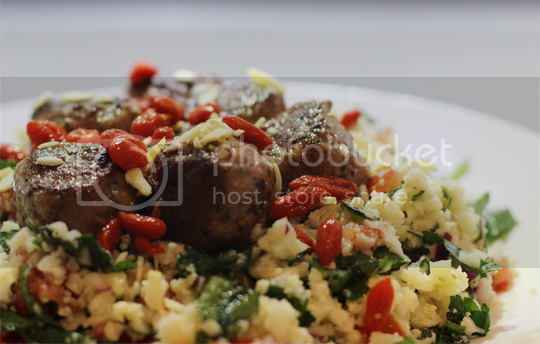 The recipe is essentially a traditional tabbouleh with what goes in it, just substituting the usual bulgar wheat with cauliflower. Quick, easy, and damn tasty, too. 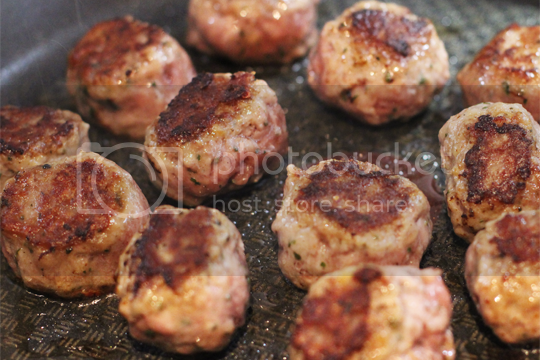 [*]Please do go ahead and make your own meatballs if you’re not lazy like me. The number you’ll need will obviously depend on the size of them, but you’re aiming for roughly 125g per portion. [**]Finely sliced radishes would be awesome here, or pomegranate seeds. Or both! Maybe sunflower or pumpkin seeds. You essentially want something for sweetness and something for crunch. I ended up going for goji berries and flaked almonds. As far as I’m aware, the only way you can buy goji berries in the UK is dried, but don’t just throw dried goji berries on top of your tabbouleh, you’ll regret it. Rehydrate them by sticking a handful in a mug and cover with warm water for at least 15 minutes, then drain. The water actually tastes lovely, it’s like a goji berry tea! Start by whizzing up the cauliflower. Remove the outer leaves and tough stalk, then separate into florets. Pulse them in a food processor until you end up with sort of rice-sized pieces. You may have to do this in two or three batches for even size – and if you don’t have a food processor, you can grate the cauli through the largest sized holes on a cheese grater instead but it will naturally take longer. Tip the tiny cauliflower pieces into a large saucepan with a splash of water on the bottom and steam over medium heat for about 5-7 minutes. Keep an eye on the water level, if it’s close to evaporating add a splash more ’cause you don’t want the cauliflower to catch on the bottom of the pan. When it’s softened, but still with a bit of bite (i.e. al dente, like pasta), drain any excess water and set aside to cool. While the cauliflower is cooling, make a start on the salad-y bit. In the interests of saving on washing up – obviously – I make the dressing in a large mixing bowl first then chuck the salad in on top of it. The dressing is super simple. 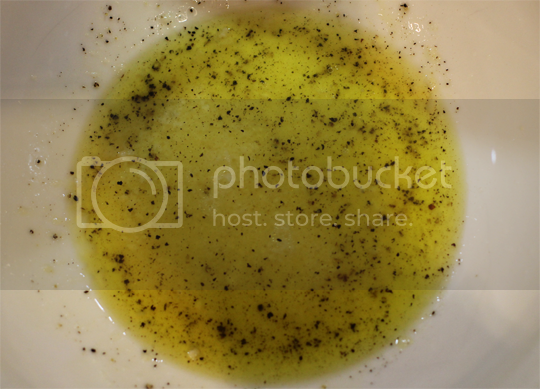 Glug in about 3 tablespoons of extra virgin olive oil, the same again of lemon juice, the garlic cloves (crushed, or very finely chopped) and salt and pepper to taste. 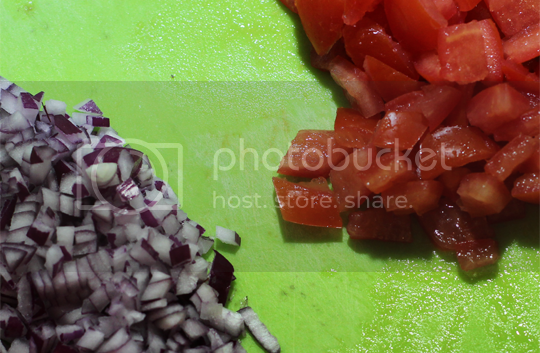 Peel and finely dice the onion, and dice the tomatoes. I scoop the seeds out of my tomatoes because I can’t stand them making salads all soggy and nasty, but that’s all down to personal preference. 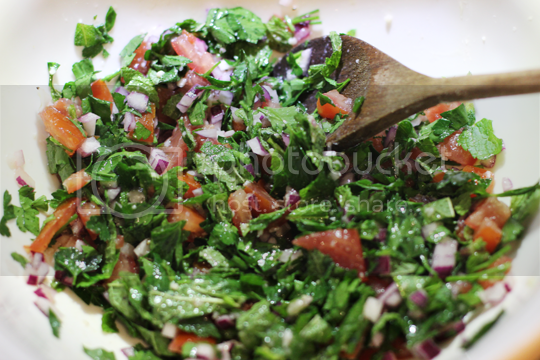 All those to the bowl with the dressing, and either chop or tear the parsley and mint leaves. Stir it all up, and that’s that part done. 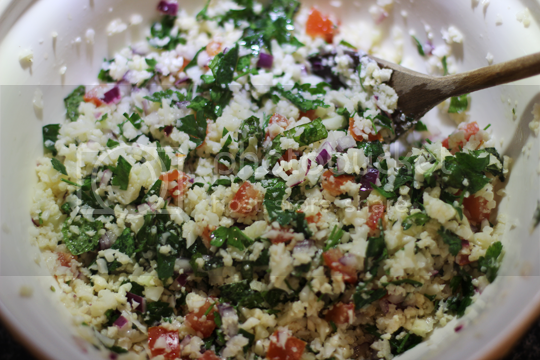 Don’t worry if it seems a tad heavy on the dressing at this point – you’ve still got all that cauliflower to add yet! 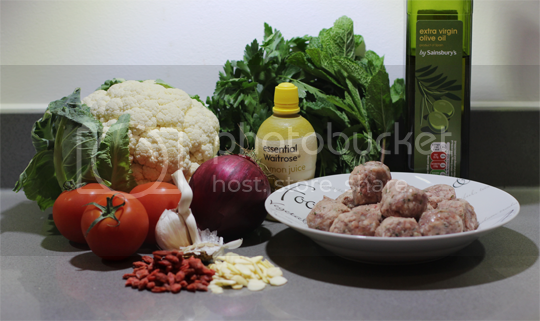 By the time the salad and meatballs are done, the cauliflower should be nicely cooled so tip that into the salad bowl and give it all a good mix. 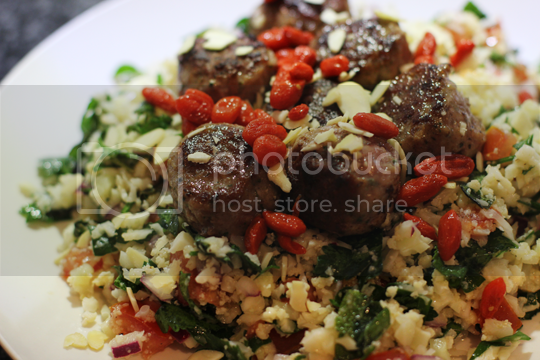 Turn out on to plates, add the meatballs and finish with your chosen toppings. Marvel at the lack of carbs and devour.